Beachfront One Bedroom Condo at The Landmark Resort Unit 232! Property Size 400 sq. ft. 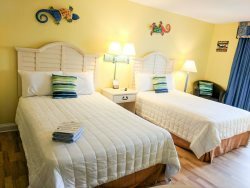 Enjoy a direct beachfront condo at the Landmark resort! This condo comfortably sleeps 6 with a king bed in the bedroom, full size Murphy bed and a new (2019) full sleeper sofa in the living area. Other features include a full kitchen that is well stocked, full bathroom and private balcony with stunning views of the Atlantic ocean! This unit is located on the 2nd floor, which is also lobby level. There are no elevators needed to access the room! The only time you'll need to use the elevator is coming from the parking garage or going to the pool! This is a big time saver, especially during peak season! Also located on this floor is the laundry facility, game room, a restaurant and a Starbucks!! PLEASE NOTE: This unit is located directly above the pool area. During peak season, there is a big potential for noise due to music from the DJ or guests at the pool. This is not within our control and will not constitute for any refunds. It's in close proximity to Myrtle Beach's most loved attractions, including Family Kingdom (.8 mi), The Boardwalk & Promenade (1 mi), Broadway at the Beach (4 mi) and only 2 miles from the Airport! The Landmark offers SO many amenities! ***Please note: Our guests do not have access to the on site mini-golf course or mini-water park across the street.